Riding hoverboards anywhere in New York City is against the law, but some lawmakers are proposing legislation that would make them legal — to the ire of some. Lawmakers were at City Hall Tuesday to propose the bill, which would regulate how hoverboards could be used. They argue that the devices are no different than skateboards and should be legal to ride around. “NYPD has a lot of work they need to do. The last thing they should be worrying about is young kids riding on hoverboards,” City Council member Andy King said. Tim Haden, who sells hoverboards at Hoodriderz, a shop he owns in downtown Manhattan, says the devices have more benefits than drawbacks. City Council member Andy King says the NYPD has more important things to worry about than kids riding hoverboards. “Ridden correctly it is safe, it’s environmentally friendly and it’s fun,” Haden said at City Hall Tuesday. Haden is legally in the clear, as hoverboards are currently legal to buy, sell and own in the city. Riding them, however, can net riders fines of $200 — more than half the price of one. Lawmakers hope to change that, but some New Yorkers don’t want to see hoverboards on already busy sidewalks. “Absolutely not, they’re really annoying,” one woman said. Police Commissioner Bill Bratton says the streets are already so crowded with pedestrians the city doesn't need hoverboards to compound the traffic. 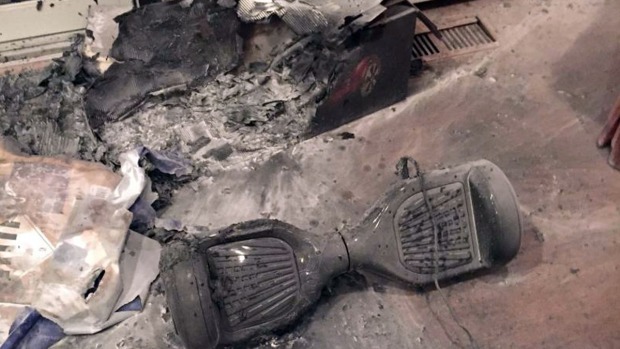 It all comes at a time when more people are questioning the safety of hoverboards, a concern only fueled by their wild popularity this Christmas. Firefighters in one Westchester town are warning residents not to charge electronics while they're away after one of this year's hottest holiday gadgets combusted in one home over the weekend. Joe Toohey reports. Videos online show people tumbling off hoverboards and others show hoverboards smoking and bursting into flames. The Consumer Product Safety Commission told NBC New York that they’re currently investigating 22 hoverboard fires in 17 states, including cases in Chappaqua, New York, and Staten Island. Amazon now bans the sale of most brands on its website. But supporters say legalizing the mode of transportation will allow for more regulation to crack down on faulty brands. “We need to stop that, and the only way to do that is if we regulate them and we legalize them so we can regulate them,” Assemblyman Jose Peralta, D-Queens, said. The bill could be taken up by the legislature in 2016, but one thing it wouldn’t do is say where you can ride a hoverboard. It would be up to the city to say if the devices should only be allowed in parks or on city sidewalks too.